Casa Roly and Irma is located in the hearth of old Havana (Habana Vieja), less than 10 minutes walking distance to Plaza de la Cathedral, Plaza de Armas and the Capitol. They rent two bedrooms with air conditioner and other facilities. Roly worked for more than 30 years at the famous bar El Floridita, so do not miss his mojitos and daiquiris. My review: Karel kwam ons ophalen van de luchthaven in zijn prachtige oldtimer taxi. We voelden ons meteen thuis in de casa. De mensen daar zijn ontzettend hartelijk en ontvingen ons met open armen. De kamer is eenvoudig, maar heeft alle comfort. Erg proper, goede bedden en een zalige douche. Het ontbijt was erg verzorgd en ook 's avonds was het eten heel erg lekker. De mojito's van Roly zijn ook absoluut top! We kunnen deze casa aan iedereen aanraden! How was the food they offer? :	Heerlijk!! My review: Highly recommended! 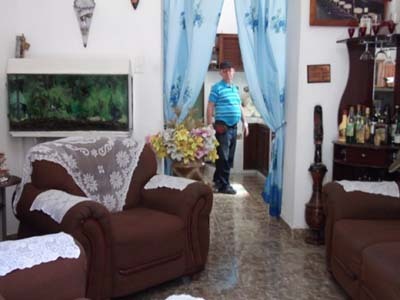 Lovely casa centrally located in Havanna Vieja. Rooms are clean and airconditioned, bathrooms are well equipped with hot and cold water and a decent flow. Breakfast and dinner are delicious and Roly makes the best mojitos in town. The family is very warm and welcoming and more than happy to give you all the help and information you need. My review: My wife and I visited Cuba and stayed at one of the hotels on the Varadero strip. We wanted to stay two nights in Habana during our Cuba adventures. I emailed Pototo and asked for a casa in Habana Vieja, with an ensuite and a no-hassle entrance where we could return to the casa late in the evening without bothering the owners too much. Pototo selected Casa Roly y Irma and after doing some research, I agreed and submitted my formal request with the dates. Pototo emailed me back with a confirmation and some advice such as phoning the casa, if possible, a couple of days before arrival. I made sure that the phone number I got for the casa was the exact number I was to phone from Varadero. I wrote on a piece of paper exactly what I wanted to say in Spanish, i.e., I would be arriving at a specific time on a certain date via Viazul bus and please don‚t give my room away. I did phone two days prior, stated my case in lousy Spanish and crossed my fingers. I‚m not sure who I talked to but the conversation was totally in Spanish. We arrived at 3pm on a Saturday, did our greetings and I said we are here for our two night stay. There was some initial confusion/doubt and they phoned somebody, Pototo I believe, after I gave them his contact information. That lasted about five minutes then everything was great. They gave me the choice of their two rooms, one with two beds and a small window and I took the other with one big bed for my wife and me, no window. The room and all the furnishings were great including a wooden safe. I was given a key to lock my room and instructions on how to use the AC. The mattress was quite soft but we slept just fine. We had everything working great with absolutely no complaints. The grand total was 80 pesos for everything including breakfast for the two of us for each morning we were there. We told them the approximate time we would come down for breakfast and everything worked perfectly. We each had a huge plate of various fruits and then our made-to-order egg meal with bread. It was a lot of food and I asked them to cut back on the amount for me as I felt bad having to leave some on my plate. Our hosts were very gracious, kind and Roly, with his previous El Floridita employment, made a mojito to die for. We told them we would possibly be returning late in the evening and they had absolutely no problem with that. You ring the bell and they let you in. I speak only tourist Spanish and they spoke little English but after one of Roly‚s Mojitos, we were having hour long conversations! Their location was fantastic for our travel agenda. The day we checked out in the morning, we cleared out of the room and they let us leave our heavy back-packs with them. We used the last few hours we to check out a few more sights then returned at 3pm, got our gear and took off for the Viazul bus station. My wife and I would recommend this casa for the cleanliness, location and the outstanding family who lives there. I liked the idea of booking through Pototo as no money changes hands till you get a chance to see the place. I had emailed Pototo a couple of times prior to arriving in Cuba as I‚m crazy about details and he was very patient and replied to all my questions. My review:	The casa was in Old Havana and was within walking distance of many shops, sights and culture. It was a fantastic location and was clean, friendly and welcoming. We enjoyed the hospitality and found Irma, Roly and their family to be perfect hosts. The food was wonderful and the helpings very generous, but more important the Mojito's were the best. We had done a little Mojito research and found that indeed Roly and Irma(who learned from Roly) make the best in Old Havana! Although they spoke little English, and we spoke only a little Spanish our time with them challenged me and has pushed me to take Spanish lessons before we go back to Cuba (and we will be back!). We had initially booked this casa for 3 nights but ended up staying for 4 as there was just so much to see and do and next t! ime may stay a few nights more. A wonderful place to stay. How was your room? : The room was adequate and had everything one needed. How was the food they offer? : Food was wonderful and we often opted to eat here rather than eating out. Other services they offer: They were very helpful in organizing transportation for us to get to Varadero. Other comments: We would recommend this casa and plan to return ourselves in a few years. There was a mix up when we arrived and we had to spend the first night in Irma's sister's bedroom before being moved into the actual room. Although I have limited Spanish and Irma has no English, we managed to communicate well enough. Irma is very attentive and will happily arrange taxis etc. Food was very good and absolutely massive in quantity. Position is ideal for old and central Havana. How was your room? : The first night it was filled with toys and ornaments! once we moved into the actual room it was perfectly adequate. The mattress was the worst of our stay in Cuba, but apart from that it was fine. Our family of 4 stayed at three different Casa's during our week stay in Cuba. The following comments provided a comparative rating between the three. Please note that all Casa's were coordinated through Pototo. We would highly recommend this service as it was easy, affordable, worry free and there was even a follow-up. - (5) Hosts -- Both Roly and Irma are wonderful, trust worthy, kind people who embrace the best of the Cuban culture and hospitality. Roly was a bartender at the famous Floridita who can whip up a fantastic mojito at any time. Irma is simply a loving person who went out of our way to coordinate, guide and make our stay and time in Havana memorable. It should be noted that Roly and Irma speak very limited English but between our translation book, hugs and warm gestures, communication was easily overcome. - (5) Location -- This Casa is in the heart of Havana Veija (old Havana), in our opinion the best part. Easily located, within walking distance of everything. - (5) Safety -- See hosts... Casa is in a great neighbourhood. There are two rooms in the home for rent, we took both, one for Mom and Dad and one for the kids. They are side by side and at the top of a staircase. Inside is a lock box for your valuables. Entrance to the Casa through their front room... simply ring the door bell and someone will open the locked metal gate or door. - (4) Meals -- Meals were good, on time, simple. Breakfast was fruit, cheese, fresh juice, coffee, bread and eggs; highly recommend breakfast at the Casa. We ate dinner meals out in Havana. During our 2 evening stays had one supper of pork, black bean soup, mojito, tomatoes, etc. Generous portions! - (3) Cleanliness -- Overall the home was very clean, especially the eating area's and bathrooms... note that each private room has a bathroom attached. However smoking is permitted in the rooms which definitely had a smell to them. - (4) Room Comfort -- Rooms were air conditioned, with private, clean washrooms with hot and cold water, toilet and shower. They supplied toilet paper and soap but be kind and bring your own and leave some behind. Kids room had individual beds, our room had a double. My wife and kids loved the beds... one of the best sleeps in Cuba, I found the mattress on the double had collapsed a bit and as a tall man woke up with a bit of a sore back in the morning. Bottom line, is the room comfort, even for me was fine. - (4) Summary - Overall we had a fantastic experience at Roly and Irma's Casa and if we visit Havana would stay there again. Thank you Roly and Irma for showing us the best of your wonderful Cuban culture and the amazing city of Havana!